I've been watching some of the Tour de France coverage this year. For me, oddly perhaps, it's not about the race but the photography. The French countryside through which the bicyclists travel is simply gorgeous. The coverage from day to day is like one big travelogue for rural France. The race itself can be exciting at times, like when someone sprints away from the pack. You sit glued to the TV to see if anyone else will break away and catch up to him. But one thing that annoys me is how some fans react. I think these guys have been standing out in the hot sun on a hillside too long sucking back the vin rouge. You see, as the bikers draw near and start to climb an incline the fans on both sides of the road crowd in and what once was a two lane road quickly becomes a gauntlet barely wide enough to fit a bike and it's rider. And the fans whoop and holler, wave flags and clap. The braver fans - or maybe the more inebriated - slap the bicyclist on the back or, stand in their way or run along beside them bumping them almost off their bikes. It's just crazy. 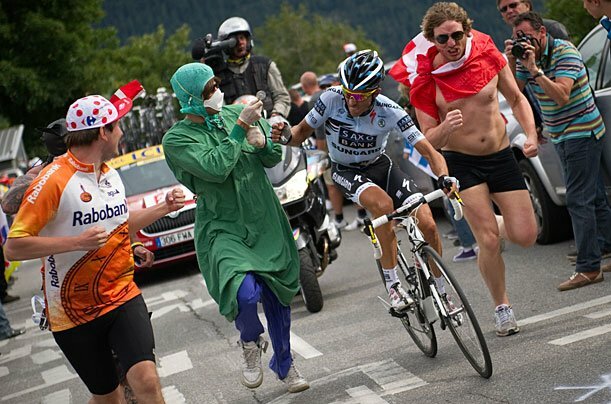 And the more die-hard fans run along beside the riders dressed up in costumes. Weird. Way to go, mon ami. This year, as far as I'm concerned, the guy in the Blue Jersey wins the Tour de France. Some of these fans are just nuts I tell ya. I love the guy in the blue jersey. He just did what most viewers simply wish they could do. Right on. Really? Wow! It's the countryside that keeps me coming back, Babs. I was watching some coverage this morning and thought exactly the same thing! Those "fans" are hazards to the riders and to themselves. But I guess the route is too long for there to be security every inch of the way. Bravo, Blue Jersey! I see Blue Jersey's wife got into the fray too right at the end there, LOL! Yeah baby -- stand by your man! Oh, man, you'll get to host thousands of yahoos. Poor you. It's absolutely crazy at certain points. I think those people camp out for days waiting for the racers to go by. And when they do they just can't contain themselves. Or you could dress up as a banana or something.